“LIFE BEGINS at forty”, according to an old saying popularised by a self-help book from the 1930s. The theory goes that years of hard work are rewarded with less stress and better pay; children begin to fly the nest; and with luck, a decent period of good health remains. A quick glance at self-reported happiness across the world appears to corroborate this view. People in their teens and early 20s start out reasonably cheerful. Gallup, a pollster, asked a representative sample of people in 158 countries to rate their life satisfaction on a scale from zero to ten. The data reported by the authors of the World Happiness Report, an academic study backed by the UN, show that happiness among people across the world aged 15-19 was 5.35 on average in 2016-18. A slow depression then appears to set in. By the age of 35-39 average self-reported happiness falls to 5.09 points. Once people hit 40 their depression gradually lifts. At the age of 70 an individual’s self-reported happiness rises to 5.58 points, on average. On this basis happiness during a person’s lifetime follows a gentle U-shape. Life satisfaction does not follow this pattern in all countries. Self-reported happiness in former Soviet states declines markedly with a respondent’s age. Among males in India it is an inverted U: happiness rises to middle-age before declining into old age. Generally, Indians are among the gloomiest in the world, their average life satisfaction has fallen by 1.2 points over the past decade. 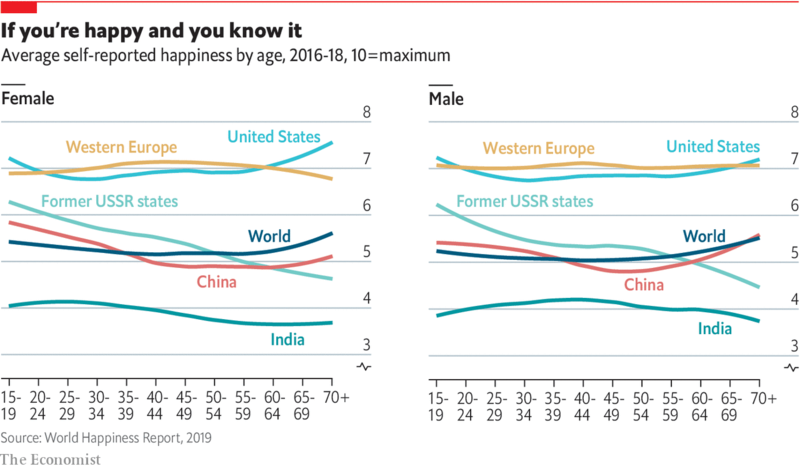 When Indian men reach their 70s they are among the least happy in the world, reporting average life satisfaction of just 3.6 points. In contrast women aged 70 and over in America appear to be the world’s happiest group of people, with life satisfaction of some 7.5 points. The reasons for these differences are not well understood, but the idea of a U shape has been discussed by sociologists for decades. One difficulty is that the data provide just a snapshot, so may simply be measuring cohorts of people rather than changes in individuals’ happiness as they age. By using longitudinal data, which tracks the same people over a long period of time, several studies have tried to find out whether happiness really is U-shaped. A 2012 study of happiness among Australians, Britons and Germans between 1980 and 2010 found that after controlling for income, relationships, health and the fact that longitudinal panels may be biased, self-reported happiness was flat between the ages of 20 and 55. It then rose through to the age of 75 as people enjoyed a stress-free life before declining sharply as their health deteriorated. Another study published in 2015 used the same data but employed a different methodology and found evidence for a U-bend in life. It posits that happiness is a simple function of vitality and emotional maturity: the latter rises with age, while vitality deteriorates with age, but in concert they combine to minimise happiness at around middle age. Children play a part, too. A recent working paper published by NBER finds that children increase the happiness of European parents, especially for the first ten years. Parents become less happy, however, if having children causes them to encounter financial difficulties. It follows, then, that happiness bounces back for financially-stretched parents once those children become financially independent, but decreases for those parents that enjoyed their children in financial comfort. Evidence for the U-bend of life might be mixed but if life does begin at 40 then it might be down to the matter of money and kids.